Born on December 14th, 1977. A singer/songwriter who can easily handle voice acting, writing lyrics, composition, arrangement, and singing. Frequenting idol events and concerts since the 90's, she has been extensively active in contributing to independent 'zines, just to state one aspect of her activities. Beginning with an internet journal she wrote in high school, Momoi was even given her own serialized column in a video game magazine. Momoi began with street lives in Akihabara and debuted with her single "Mail Me" in 2000. Her bishojo game song unit "UNDER17" formed in 2002, giving energetic performances while continually releasing new singles, and disbanded in 2004. 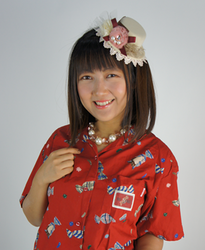 As a lyricist and composer she contributes countless pieces for Afilia Saga, Kotone Mai, Uesaka Sumire, the voice actress unit RO-KYU-BU!, video games and other artists. Momoi has played countless roles as a voice actress, including Nakahara Komugi in "Nurse Witch Komugi", Faris Nyannyan in "Steins;Gate", Aita Yurume in "Yurumeitsu 3D", Seto San in "Seto no Hanayome", and Anise Tatlin in "Tales of the Abyss". As the 'Original Queen of Akiba", she is involved in vigorous activities under the concept "Worldwide from Akiba" in many places including North America, Central America, Mexico, Russia, Europe, Asia and elsewhere. She even took her first expedition to Oceania in 2013. From 2005-2013, she made a total of 36 trips to 15 different countries and has many fans overseas. Her one man concerts in Japan always include many visiting international fans and offer rich intercultural exchange.